The San Andreas fault, where the North American and Pacific continental plates meet and grind together, a mountain range was formed millions of years ago. The single range divided and was cut at a right angle by streams flowing toward the lower basin, the higher plate tore away from the ridges. To the east, the San Bernardino range, to the west, the San Gabriels. This breach in the mountains became the "Cajon Pass." In Spanish, "Cajon", translates to "Box", which they felt the pass was shaped like. 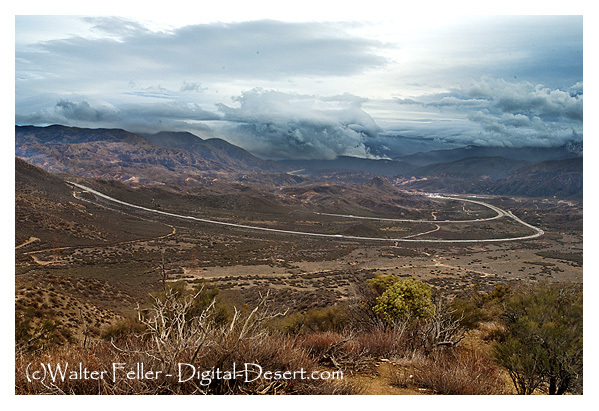 The Cajon Pass was lived in and around by the Serrano Indians, although the Indians of the desert would travel through on nearby trails to trade with the coastal indians. Spanish soldier, Pedro Fages, first traveled through the pass in his search for deserters from the Spanish Army. Horse thieves such as Walkara, known as the "Greatest horsethief in history", used the pass to escape with his thousands of horses stolen in raids. Later, Mormon pioneers, and those eager to find gold in the rush up north. Trails were worn and established, and several smaller passes were used to enter the valley. Eventually, a toll road was cut and graded. A railroad was built; the toll road was paved, realigned and became the Old National Trails highway. Later on, the highway was upgraded again and became Route 66. Various shots road and related of Historic Route 66. Rest stop for Mormon travelers on the Mormon Road on the way to San Bernardino. Unusual sandstone rock formation created by San Andreas fault. Sag pond fed by spring emerging from the San Andreas fault. Deep and cold.